So you’re getting ready to buy a house. Congratulations! Before you start picking out a fancy birdbath and a perfect welcome mat, there’s something you need to consider: Is your budget ready to handle monthly mortgage payments? If you’re not buying with cash, this is an important question to ask. Knowing what’s included in a monthly mortgage payment and how much home you can actually afford are key steps to finding a home that will fit your long-term goals. So, to get a better grip on what the heck you’re paying, why you’re paying it, and for how long, let’s break down a typical monthly mortgage payment. Don’t be tricked here. What we call a monthly mortgage payment isn’t just paying off your mortgage. Instead, think of a monthly mortgage payment as the four horsemen: Principal, Interest, Property Tax, and Homeowner’s Insurance (called PITI—like pity, because, you know, it increases your payment). How do these guys ride together in your monthly mortgage payment? You can find out by using our mortgage calculator. The first part of a mortgage payment is the principal. Principal is the original chunk of money you borrow from your lender to buy a house. Let’s say you buy a $200,000 house with a 20% down payment of your own money ($40,000), and you borrow the rest. That means, your starting principal balance is $160,000. Sounds easy enough. But hang on—if you think principal is the only amount to consider, you’d be forgetting about principal’s best friend: interest. It’d be nice to think lenders let you borrow their money just because they like you. While that might be true, they’re still running a business and want to put food on the table too. Lenders are interested in letting you borrow their money because they make money on what they loan you. Interest is a percentage of the principal—the amount of the loan you have left to repay. Interest is a percentage of the principal—the amount of the loan you have left to repay. Mortgage interest rates are constantly changing, which is why it’s smart to choose a mortgage with a fixed interest rate so you know how much you’ll pay each month. A variable interest rate, like you find with ridiculous adjustable rate mortgages (ARMs), makes the amount of interest you pay from year to year as changeable as the wind. Stay away from ARMs (or any other loans that sound like body parts). Mortgage interest rates are constantly changing, which is why it’s smart to choose a mortgage with a fixed interest rate so you know how much you’ll pay each month. Let’s see how this plays out in our example of the $200,000 home with a 20% down payment. Your principal balance is $160,000 and you agree to pay it back within a 15-year term with a 4% fixed interest rate. That would mean you’d pay a whopping $533 on your first month’s mortgage payment. How Are Monthly Principal and Interest Payments Calculated? This means you’ll pay $253,000 (including your down payment) by the time everything is said and done and your house is paid off. That would make your monthly mortgage payment $1,184 each month. The next month, you’ll pay the same $1,184, but less will go to interest ($531) and more will go to your principal ($653). That trend continues over the life of your mortgage until, by the end of your mortgage, nearly all of your payment goes toward principal. And that’s the goal—to enjoy your home and get it paid off as soon as possible! Cue the confetti! When you buy a house, your local government will “welcome” you to the neighborhood by charging you property tax. Even if you bought your home with cash, you won’t be off the hook because property taxes pay for firefighters, police, schools, roads and other public services. When do you pay your property taxes? While your local government charges property taxes every year, you can pay them as part of your monthly mortgage payment. Every month you pay a portion of your property taxes on top of your monthly mortgage payment, and your lender usually saves up those payments in a separate account called an escrow. At the end of the year, an escrow company will take all the money in your account and pay your property taxes. Out of sight, out of mind. What a relief! How are your property taxes calculated? A lot of people get confused here, so keep this in mind: Property taxes are based on the assessed value, not the market value. What’s the difference? The market value is the price you agreed to pay for your house. The assessed value, on the other hand, is set by a property assessor, who will look at your house and tell your local government what it’s worth. For example, you might buy a $200,000 house that a property assessor says is worth $140,000. If your local county tax rate is 1%, you’ll be charged a property tax of $1,400 per year—or a monthly property tax of $116. Finally. We’re on the last leg of PITI: insurance. Look, everyone who buys a house needs homeowner’s insurance—no ifs, ands, or buts about it. That’s not necessarily a bad thing. Rather than risk having to pay to repair or rebuild your home (your biggest investment!) after a fire or tornado, homeowner’s insurance takes the risk off your shoulders and gives it to your insurance company. What a relief! When do you pay your homeowner’s insurance? Remember that nice, fancy escrow account you had with your property taxes? Well, guess what? It’s back. As with your property taxes, you’ll pay part of your homeowner’s insurance premium on top of your principal and interest payment. Your lender collects those payments in an account, and at the end of the year, your insurance company will draw all that money when your insurance payment is due. How much homeowner’s insurance do you have to pay? This all depends on how much homeowner’s insurance you need to buy. If you’re having trouble deciding how much homeowner’s insurance is right for you, talk to an independent insurance agent. They’ll help you get the best price without sacrificing coverage (which unfortunately a lot of homeowners do). Let’s add homeowner’s insurance in our example to make rubber meet the road and see what a complete monthly mortgage payment will look like. Suppose your insurance policy charges $75 per month. Well, folks, that would bring your complete monthly payment to a total of $1,375. Strictly speaking, a monthly mortgage payment is made up of PITI—but you may have to pay other mortgage related fees, such as private mortgage insurance and/or homeowners association fees. PMI isn’t meant to protect you. It’s meant to protect the lender from you—well, at least from the possibility that you can’t, or just flat don’t, make your mortgage payments. Of course, that would never be you—but the lender doesn’t care. If your down payment is less than 20% of the home’s price, you’re going to get slapped with PMI. This is yet another reason to save 20% for a down payment. Usually lenders calculate PMI by taking .5–1.5% of your principal and slapping it on your mortgage payment. For example, a .5% PMI payment on a $180,000 loan would add $900 per year, or $75 per month, to your payment. $900 extra per year! Think of what else you could be doing with that money! An HOA fee goes to maintaining the property and shared facilities or services that are part of certain private residential communities like condos, townhouses or gated communities. Basically, they keep your place looking spiffy. If you belong to a community like one of these, don’t overlook your HOA fee. Depending on the age and size of your house and the amenities, this could add anywhere from $50–$350 to the amount you pay each month for your overall housing costs. There are many types of mortgages and they all charge different monthly payment amounts. But don’t make the mistake of choosing a mortgage just because it has the lowest monthly payment. If you want to build wealth that lasts, focus on total cost. Hint: The mortgage with the lowest total cost is a 15-year fixed-rate conventional loan. A good gauge to tell if you can afford a mortgage is if the monthly payments are no more than 25% of your monthly take-home pay. If you’re buying a house and need help finding a great home in your price range, be sure you’re working with a top-notch real estate professional who can help you find the house of your dreams. Since you want to get a mortgage the smart way, connect with our friends at Churchill Mortgage. 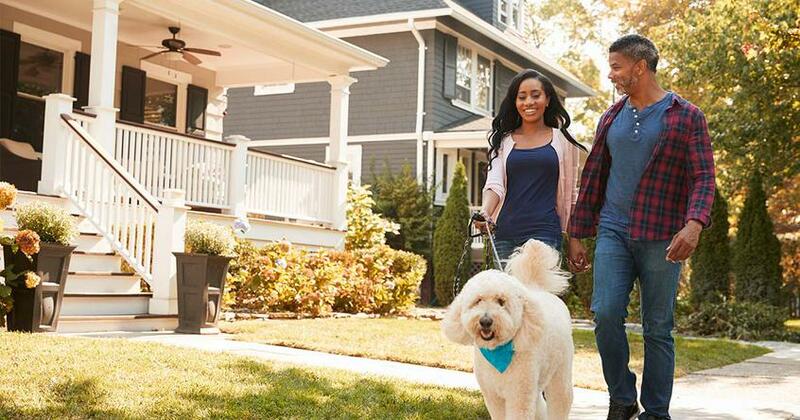 They’ll walk with you every step of the way to put you on the best path to homeownership.